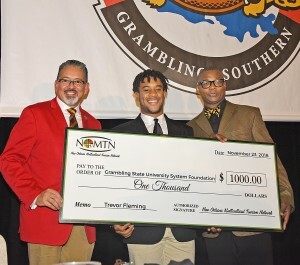 Grambling State University student-athletes and notable alumni were recognized for accomplishments in scholarship, service, and lifetime achievement the 45th Bayou Classic Coaches Luncheon. Grambling State long snapper Trevor Fleming also earned an honor during Friday’s luncheon. He was named the 2018 New Orleans Multi-Cultural Tourism Network (NOMTN) recipient. The second annual scholarship will be $1,000 to each university recipient and are to be redeemed during the upcoming spring semester. Eddie G. Robinson was posthumously inducted into the MVP Club. Robinson holds the distinction as the second-most winningest head football coach in NCAA Division I history and the third most overall. From 1985-2011, Robinson held the NCAA Division I record for most wins, which has since been broken by former Penn State head coach Joe Paterno. For 56 years, from 1941 to 1942 and against from 1945-1997, Robinson was the head coach at Grambling State. During that stretch, he built the Tigers into a college football powerhouse. Robinson retired in 1997 with a career record of 408-165-15, and coached every single game from the field. He was inducted into the College Football Hall of Fame in 1997. Doug Williams received the Grambling State University Lifetime Achievement Award. Williams attended Grambling State, where he played for legendary head coach Eddie Robinson. He guided the Tigers to a 46-7 record as a four-year starter at quarterback and led Grambling State to three SWAC Championships. In addition, he was named the Black College Football Player of the Year twice. In 1977, Williams led the NCAA in several categories, including total yards from scrimmage (3,249), passing yards (3,286), touchdown passes (38), and yards per play (8.6). Williams finished fourth that year in the Heisman Trophy voting, behind Earl Campbell, Terry Miller and Ken MacAfee. After graduating from Grambling State, Williams was drafted in the first round (pick 17) by the Tampa Bay Buccaneers. He would spend four years with the Buccanneers, one year with the Oklahoma/Arizona Outlaws and three years with the Washington Redskins. He became the first black quarterback to play in a Super Bowl and earned Super Bowl MVP honors after the Redskins defeated the Denver Broncos in Super Bowl XXII. After his time in the NFL, Williams, who is listed as one of the 80 Greatest Washington Redskins and has his named inducted into the Washington Redskins and Tampa Bay Buccaneers Ring of Honor, became the head football coach of Grambling State in 1998, succeeding Eddie Robinson. He led the Tigers to three consecutive SWAC titles from 2000-2002, before leaving to rejoin the Tampa Bay Buccaneers as a personnel executive. Williams, who with fellow Grambling State alumnus James Harris, founded the Black College Football Hall of Fame in 2009. He currently is the Senior Vice President of Player Personnel for the Washington Redskins. 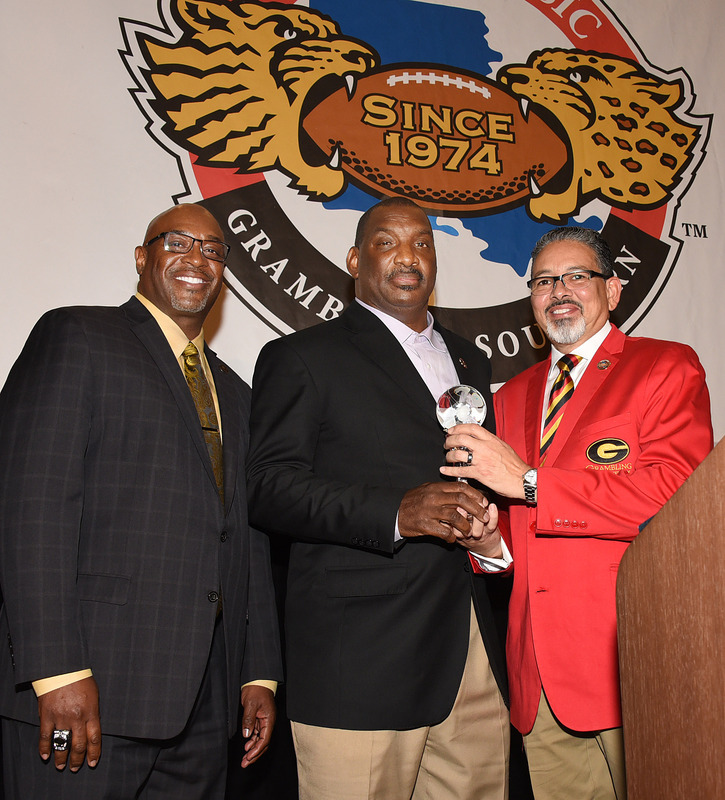 Daryl Washington was named the Grambling State University Alumni Honoree. Washington was named Attorney of the Year in 2007 by the National Bar Association’s Sports, Entertainment and Art Section. Additionally, as the 2007-2008 Regional Director of Region V (Louisiana, Mississippi and Texas) for the National bar Association, his region received the Association’s Outstanding Region of the Year Award. 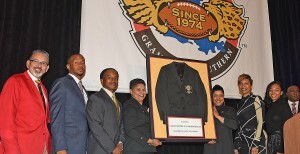 Washington, who was a member of the Grambling State football team, was presented the Southern University Law Center Distinguished Alumni Award at the 2011 National bar Association Convention. Washington earned his J.D. degree from Southern University Law Center and his Bachelor of Science degree in Accounting from Grambling State University where he was a member of the football team. Kickoff for the 45th Annual Bayou Classic between Grambling State and Southern is set for 4 p.m. at the Mercedes-Benz Superdome. The game can be seen live on the NBC Sports Network.